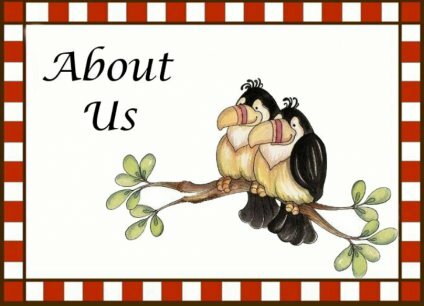 We are two crafty ladies, neighbors & friends who have tried our hands at a multitude of hobbies over the years including folk art, stain glass, jewellery, woodworking, numerous sewing projects & a wide assortment of country crafts & critters. We first entered the quilting world by creating memory quilts for family members. For our next challenge, we decided to enroll in a quilting class & tackled our first real quilts – each making a full-size beginner’s sampler quilt. After that, we were hooked!! This ultimately led to our passion for quilting & eventually for designing our own creations. 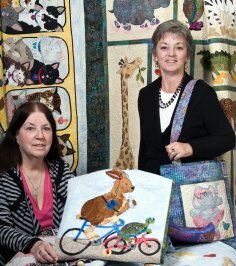 to purchase the pattern that this led us to produce our pattern - HBH102 Pet Lover’s Bag - which we thought could be sold to friends & possibly even local quilt shops. Our bag pattern was so successful , that we decided to try our hand at designing our first wall hanging – HBH101 Furever Friends, followed by HBH103 Munch A Bunch. A flame was ignited & our passion for quilting has now evolved into an addiction to designing & seeing our ideas come to life, both in our samples & in the individual interpretations of our customers. It is very rewarding to receive such positive feedback for our efforts & exciting to see other’s completed versions of our patterns. We take great pride & effort in creating & producing the best quality work. We would love to hear from you & see your completed project. Please email a picture to: harebrainedhappenings@yahoo.com and we will add it to our picture album. 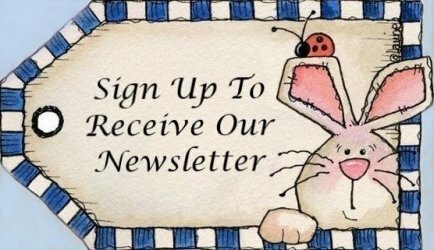 Please click on our Patterns icon to view all of our patterns to date. Most of our patterns include hand drawn full size graphics & are done using machine appliqué & usually depict our favorite subjects – animals, children & nature. Our Trunk Show consists of a slide presentation & display of our pattern quilts; it is approximately 1 hour long & we keep it light and fun. The Same But Different is a short slide presentation showing a number of full size quilts & wall-hangings we have both made, each starting with the same fabrics, but showing the different results. The slide presentation continues into our second part of the program where we each show some individual projects we have made over the years. As well, we will bring along a few of our individual projects & some guild challenge pieces. The third part consists of our 37 pattern samples we bring along for guests to see, touch & feel. Our 5-hour Workshop is a fun, intense class & preferably held the next day after the trunk show, especially if we are traveling out of town. Travel time will be combined if the trunk show & workshop are back to back. The “ColourPlay Weekender Bag”- pattern #HBH401 is very popular for workshops & most may go home with their bag close to completion. There is some preparation work at home before class.